It’s not a very well-kept secret that the men as a whole in the church are struggling. There are more active women than men. In the 20-30 age range there are more single women, than single men. More families are without fathers in the home them without mothers in the home. And the inactivity rate for men coming out of the young men’s program is staggering high. 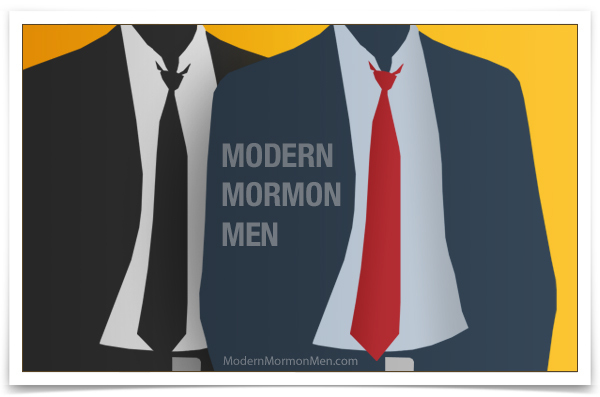 We have some issues with us as Modern Mormon Men. The Church has been talking about this for a few years now. 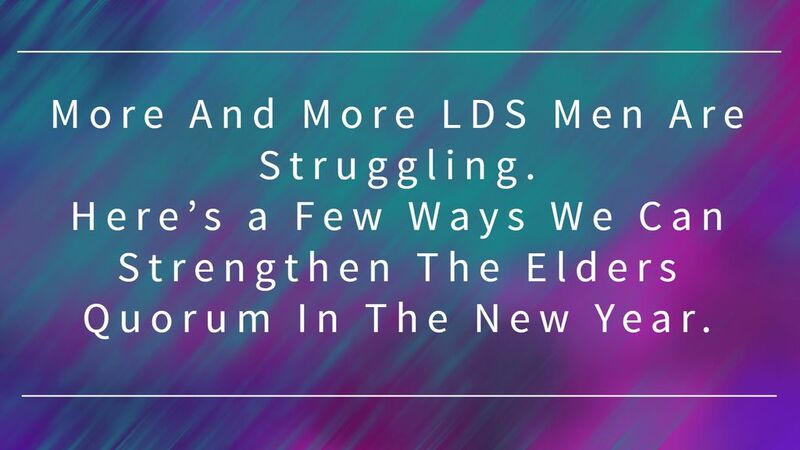 I even think that this was one of the main reasons for the changes to the Elders Quorum this year. We are not in defcon 5 by any means, but we are certainly due for a course correction to increase / change the way we strengthen ourselves and our brothers in the church. This is a group article. A bunch of us here at MMM some how started discussing the topic and we came up with a set of six points. Three that address fallacies with the way we and the church assume the adult men in the church are getting spiritually feed. And three items that wards and quorums already have the authority to do according to the handbook that can be changed. The other, to its loss. Both His, and His mother's. His pain to bear up others. Why were all the inn rooms taken? He cried for help in that dark hour. Had God His Son forsaken? Nowhere for them to stay and rest. Crowds spitting in his face. He knows hard roads we take. And how our hearts will ache. Because of our souls’ worth. Carries us with His grace. Merry Christmas! Its been a huge year of change in Mormon Church of Jesus Christ of Latter-day Saints land. So, the guys over here at MMM thought we would bring you some Christmas cheer in the form of the twelve days of Christmas, featuring the twelve biggest changes in the church over the year. 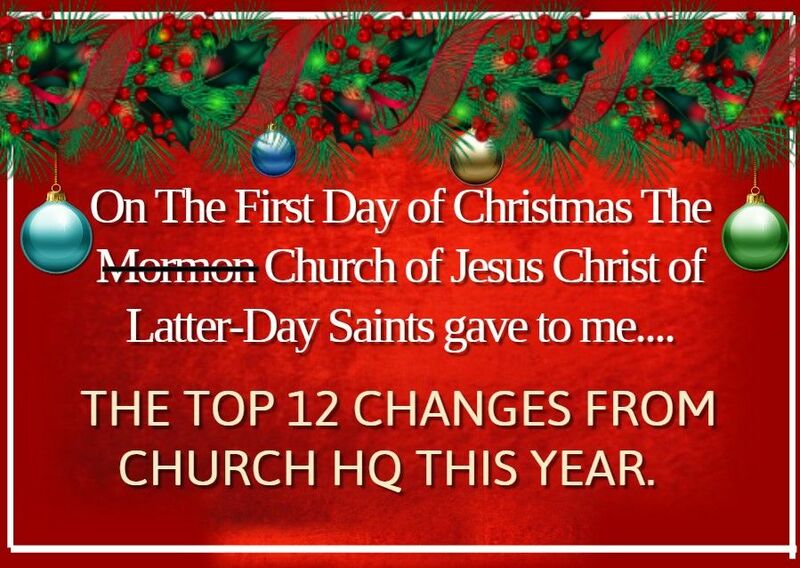 On the first day of Christmas the Mormon Church gave to me…. A new first presidency! If we are going to talk about this new first presidency, we have to talk about what came before it, way before it and that was Nelson and Oaks. Two bros, the highest-ranking Modern Mormon Men. 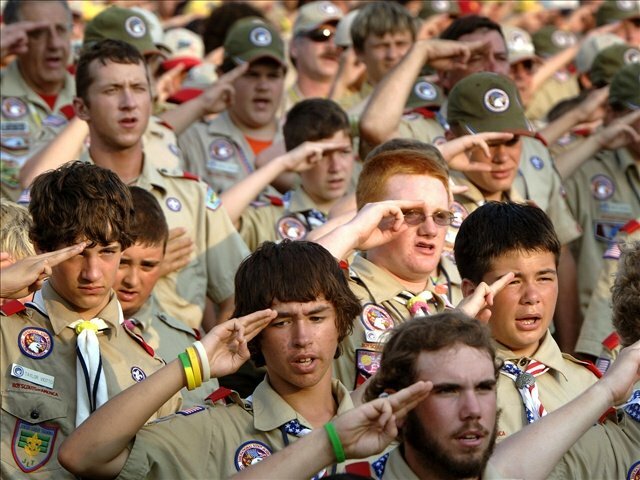 Bob Mims at the Salt Lake tribune put it this way “There they always were. The lawyer and the Doctor. The judge and the surgeon. The apostle and the… apostle.” These two are close, besties, I think the term Bromance is appropriate. I am willing to make you a bet that somewhere between five and ten years ago President Nelson and President Oaks hunkered down in a cabin by Bear Lake, Utah in a brainstorming session (probably over a raspberry shake) about all the changes they would make once Nelson became prophet. I am also willing to bet they wrote down on something like, a paper towel, all the things they are going to change. I am dead serious, stuff is just rolling out too fast, this has been planned for a long time. And every time something new rolls out I bet they have a little victory party in Nelsons office where they pull out the paper towel and cross of the item that just changed, then they probably toast their success with a Chery Coke. And don’t forget about Eyring, poor guy! Imagine how hard it must be to try to reign in Nelson and Oaks! I kind of think that a graduate of the graphic arts department at BYU got hired to do a movie poster and while struggling for a concept late one night in his living room he looked up and had a vision (saw the painting on his wall). I bet you a thousand bucks his wife slapped him with a rolled-up Ensign when she saw his "new" poster! What does everyone think? Heck there is even a change.org petition on it if you want to really get involved. Or you can just laugh at the whole thing. Or you can go to the change.org petition and laugh at the comments, which is currently what I doing. Fun Fact: While the LDS painting was commissioned by the Church it was painted by a Seventh Day Adventist. Yesterday I had an amazing experience. I was invited to do a presentation at Ellington Joint Reserve Base. Its a multipurpose base in Houston Texas that serves NASA, the Coast Guard and acts as a military base for reserve units of each branch. The entire experience was amazingly impressive. About twenty minutes before I was scheduled to arrive, I got a text from a Petty Officer in the unit I was going to visit. I got to the security gate, presented my ID. The guard said they were expecting me and handed me a customized map of where I was to go. The map guided me perfectly to the building and as I was getting out of my car was greeted by the Petty Officer and a Seaman. The seaman immediately asked to carry my bag and then politely took it from me. There was no option, he was going to carry my bag. I had a few more things in my truck for the presentation and in about two minutes four very fit, very well-behaved gentlemen were carrying the contents of my truck into the presentation room. I got to the front door of the building and immediately I was greeted by another sailor who opened the door for me, “good afternoon sir my name is seaman Yadul, welcome to Ellington we are all looking forward to your presentation”. Once to the room the four sailors immediately started to setup my presentation. I did not give them instructions and if they had a question they asked, but for the most part they looked at what I had brought with me, accessed the items and set them up just as I would have. I was absolutely shocked. I have done hundreds of presentations all over the world, this level of competency and professionalism was a first. Do I want to stand on a runway while Airforce one lands and then see them prep the plane for the late president and his family? YA I do! Just then the unit of about thirty people filed into the room from lunch, everyone introduced themselves and welcomed me. The Petty Officer stood up, the room immediately went silent. He walked to the front of the room and introduced me to the unit. I started what was a rather technical presentation. About thirty minutes latter the Chief walked in, waited for a natural break in my speech, then said it was time for Airforce One to land. Without instruction and in almost perfect order the unit emptied the room, walked down the hallway, out the building, over to a hanger, through the hanger, out the big door and onto the runway. There about three hundred yards in front of me Airforce one landed. I could feel the wind the landing made, it was awesome! It then taxied around us and parked about five hundred yards away next to a long line of black suburban’s, buses and a hearse. The unit was at ease (no president in the plane) but they were near silent talking in whispers. None of them were old enough to have even been alive when Bush 41 was president, but I heard several of them say “I read this about him” or “do you know ___ about him”. You could feel the level of respect they had for Bush 41. It was actually very touching.